Has your tortoise peeked out? A few tortoises have emerged to greet the very warm February weather in Las Vegas. It's very exciting to see those cute faces! Do remember that it's only February. We can hope that cooler weather will return and tortoises can continue to brumate. If you see your tortoise: It will probably bask or even browse a little Watch and enjoy It's too early to offer food Most tortoises emerge from brumation in March and April. 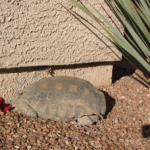 Of course with our unusual weather, who know what signals the … [Read more...] about Has your tortoise peeked out?